We've got something to suit everyone! The numerous panel formats from the wineo laminate flooring collections offer more design variety than ever before. Thanks to the handy small format of 1380 mm × 160 mm, small spaces manage to look bigger. 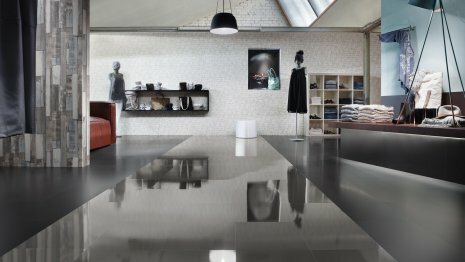 With the wineo 550 collection, we have achieved a modern tile look that doesn't only impress in kitchens and bathrooms. We have designed the laminate panels for wineo 550 to give them a conventional tile format XL panels in a style befitting a country house are another very popular design and enable large areas to be covered very quickly as well. The different formats ensure that each decor style is displayed to best effect – for complete design success and, above all, an interior design that suits your individual taste. Our laminate floors with V joint (small V4, medium V2, large V2) give you innumerable design options. Thanks to their LocTec locking design, they can all be combined with each other. These products offer an elegant plank format with V joint all around and an embossed surface that creates an authentic texture without repetitions. You can lay the laminate panels just as you want to. For example, you can lay a row of one colour or combine several colour variants. See what can happen here. The colours and panels in our wineo 550 tile laminate range can also be mixed and matched, producing wonderful combinations with a matt or high gloss finish.